In the early morning hours of June 22, 1941, Axis armies launched a sneak attack on the Soviet Union, touching off the greatest conflict in human history. Millions of men fought and died in what became known as the Great Patriotic War. 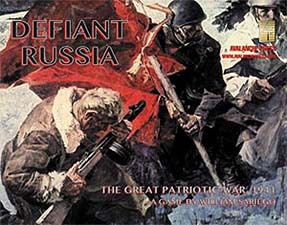 DEFIANT RUSSIA is our fast-playing game of this titanic struggle. DEFIANT RUSSIA puts its emphasis on fast and challenging play. Play is easy; strategy, not so much.